There is a claim constantly circulating the EU: ‘multiculturalism is dead in Europe’. Dead or maybe d(r)ead?... That much comes from a cluster of European nation-states that love to romanticize – in a grand metanarrative of dogmatic universalism – their appearance as of the coherent Union, as if they themselves lived a long, cordial and credible history of multicul-turalism. Hence, this claim and its resonating debate is of course false. It is also cynical because it is purposely deceiving. No wonder, as the conglomerate of nation-states/EU has silently handed over one of its most important debates – that of European anti-fascistic identity, or otherness – to the wing-parties. This was repeatedly followed by the selective and contra-productive foreign policy actions of the Union. 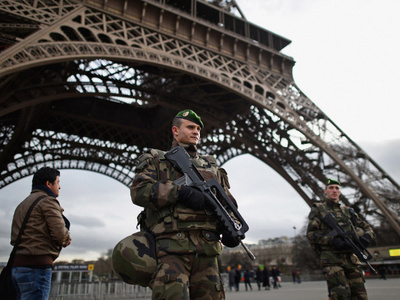 Paris shootings, terrible beyond comprehension, will reload and overheat those debates. However, these debates are ill conceived, resting from the start on completely wrong and misleading premises. Terrorism, terror, terrorism!! – But, terror is a tactics, not an ideology. How can one conduct and win war on tactics? – it is an oxymoron. (In that case, only to win are larger budgets for the homeland security apparatus on expenses of our freedoms and liberties, like so many times before.) The January assassins in the Parisian Satirical Magazine (and subsequent hostage crises) as well as these of bloody Friday of November are Islamofascists. The fact that these individuals are (again) allegedly of Arab-Muslim origins and seemingly clero-indoctrinated does not make them less fascists, less European, nor does it abolish Europe from the main responsibility in this case. How do we define that challenge will answer us whether we live the real democracy or are blinded by the formal one. Fascism and its evil twin, Nazism are 100% European ideologies. Neo-Nazism also originates from and lately unchecked blossoms, primarily in Europe. Some would say of today; an über-economy in the center of continent, surrounded from all sides by the recuperating neo-fascism. The Old continent tried to amortize its deepening economic and demographic contraction by a constant interference on its peripheries, especially meddling on the Balkans, Black Sea/Cau-casus and MENA (Middle East–North Africa). What is now an epilogue? A severe democratic recession. Whom to blame for this structural, lasting civilizational retreat that Europe suffers? Is it accurate or only convenient to accuse a bunch of useful idiots for returning home with the combative behavior, equipped with the European guns and homegrown anger of the misused? My voice was just one of the many that included notables like Umberto Eco, Bono Vox and Kishore Mahbubani –foster moderation and dialogue, encourage forces of toleration, wisdom and understanding, stop supporting and promoting ethno-fascism in the former Yugoslavia and Ukraine. These advices were and are still ridiculed and silenced, or in the best case, ignored. Conversely, what the EU constantly nurtured and cherished with its councils, boots and humanitarian aid starting from Bosnia 25 years ago, Middle East, until the present day Ukraine was less of a constructive strategic engagement and lasting-compromise, but more of a history-rewriting, cult of death, destruction, partition, exclusion and fascism. (Some of the most notorious regimes on this planet are extensively advertised and glorified all throughout the EU– including its biggest sports events and the most popular sports. No matter, that one of these hereditary theocracies considers as a serious criminal offence– brutally coercing like European Nazis did in 1930s – if the prescribed state religion is not obeyed as the only existing one). On the other side, European temple of multiculturalism – Sarajevo, was barbarically sieged and bombed for 1,000 days – all that just a one-hour flight from Brussels. Still, 20 years after falling a victim of unthinkable genocide, Bosnia remains the only UN member state in the world that does not exercise its sovereignty. It is administratively occupied by the opaque and retrograde international bureaucracy – predominantly overpaid European apparatchiks that institutionalized segregation in this, victimized then criminalized, country. Illuminating cradles of multiculturalism – some of the brightest verticals of entire human civilization such as Jerusalem, Bagdad and Damascus still suffer unbearable horrors of externally induced, rather ahistorical destruction, hatred and perpetuated purges. With such a dismal ‘export’ record, universal claim of the European political system or even its historic perspective does not hold water anymore. As the saying goes, when there is no opportunity, give at least a lame hope. That is what Europe keenly helped with in the Middle East: The very type of Islam Europe supported in the Middle East yesterday, is the version of Islam (or better to say, fascism), we are getting today in the Christian Europe as well as in the Christian neighborhoods of Iraq, Syria and Lebanon. Eventually, the ‘last world’s cosmopolitan’ – as the EU is often self-portrayed – compromised its own perspectives and discredited its own transformative power’s principle. The 2012 Nobel Peace Prize Laureate, EU did so by undermining its own institutional framework: the Nurnberg principles and firm antifascist legacy (UN and CoE), Barcelona Process as the specialized segment of from-Morocco-to-Russia European Neighborhood Policy (EU) and the Euro-Med partnership (OSCE). The only direct involvement of the continent was ranging between a selective diplomatic de-legitimization, satanization in media, false-flag or proxy assaults, and punitive military engagements via the Atlantic-Central Europe-led coalition of the willing (the Balkans, Iraq, Libya, Syria, Ukraine). This naturally results in a massive influx of refugees, a consequence to which Europeans usually respond by criminalizing migrations and penalising the immigrants’ way of life. Confrontational nostalgia prevailed again over both that is essential for any viable future: dialog (instruments) and consensus (institutions). The consequences are rather striking and worth of stating once more: The sort of Islam that the EU supported (and the means deployed to do so) in the Middle East yesterday, is the sort of Islam (and the means it uses) that Europe gets today. Small wonder, that Islam in Turkey (or in Kirgizstan and in Indonesia) is broad, liberal and tolerant while the one in Atlantic-Central Europe is a brutally dismissive, narrow and vindictively assertive. Our urgent task – if we are any serious about Europe– is denazification. Not a one-time event, but a lasting process. Let’s start from Bosnia, Ukraine and Paris at once. How many more have to die before we accept and acknowledge the inevitable – Denazification process is urgently needed in Europe! Author is chairperson and professor in international law and global political studies, Vienna, Austria. He authored three books: FB – Geopolitics of Technology (published by the New York’s Addleton Academic Publishers); Geopolitics – Europe 100 years later (DB, Europe), and the just released Geopolitics – Energy – Technology by the German publisher LAP. No Asian century is his forthcoming book, scheduled for mind next year. Lasting conflicts in the multireligious and multinational countries nobody can win. Therefore, the severity and length of atrocities as well as the magnitude of suffering of civilians in the former Yugoslavia, Iraq, Libya, Syria and Ukraine are meaningless from the military or any logical point of you, unless the very objective is something else. What if war is used as an instrument of mass torture, not for a geostrategic advancement but for a social reengineering, e.g. Nazification? The conduct is as follows: (i) destabilized central authority; (ii) systematic and prolonged sectarian violence to the point of ‘we cannot forgive, we cannot live together anymore’; (iii) partition, hysteria, further atomization; (iv) ethno-fascism; (v) permanently dysfunctional government, easily controllable on remote control. While the cacophony of European contradictions works more on a self-elimination of the EU from the region, Turkey tries to reinsert itself. The so-called neo-Ottomanism of the current (Anatolian, eastern rural power-base) government steers the country right into the centre of grand bargaining for both Russia and for the US. To this emerging triangular constellation, President Erdoğan and its PM Davatoglu wishes to appoint its own rhythm. Past the ‘Arab Spring’, neither will Russia effectively sustain its presence in the Middle East on a strict pan-Arabic secular, republican and anti-Islamic idea, nor will the US manage to politically and morally justify its backing off of the absolutistic monarchies energized by the backward, dismissive and oppressive Wahhabism. Ankara tries to sublimate both effectively: enough of a secular republican modernity and enough of a traditional, tolerant and emancipating Islam, and to broadcast it as an attractive future model across the Middle East. Simply, Bosporus wakes itself up as an empiric proof that the Islam and modernity goes together. In fact, it is the last European nation that still has both demographic and economic growth. Moreover, Ataturk’s Republic is by large and by far the world’s most successful Muslim state: It was never resting its development on oil or other primary-commodity exports, but on a vibrant socio-economic sector and solid democratic institutions. This is heavily contesting, not only for Russia, but primarily for the insecure regime of the House of Saud (and other GCC autocracies), which rules by the direct royal decree over a country of recent past, oil-export dependent and fizzing presence and improbable future. No wonder that on the ideological battlefield, the two belligerent parties will be dominating the Middle East, which is currently in self-questioning, struggling past yet another round of hardships. The outcome will be significantly beyond the Arab world, and will reverberate all across the Sunni Muslim world. Ankara is attempting to justify that the Saudi-promoted Islam is actually a toxic, separatist/sectarian Wahhabistic ideology that self-constrains Muslims, and keeps them on a wrong side of history by hindering their socio-economic and political development. It does so, Turkey claims, by holding Muslims on a permanent collision course with the rest of the world, while Turkey-promoted Islam is not a weaponized ideology, but a Modus Vivendi, which permits progress and is acceptable for all (including the non-Muslims), with the centuries-long history of success. Tim Lister Europe's resurgent far right focuses on immigration, multiculturalism, CNN (July 24, 2011). The above warnings by Dr. Bajrektarevic are prophetic in nature: a warning which can easily be placed together with those of a Kierkegaard on dehumanization (“the sickness unto death”...) and human destiny, as well of those of Habermas on multiple modernities in the EU (see today’s Ovi Symposium). Let those who have ears let them hear; for the deaf are unfortunately doomed from the start. Our foreign policy is sadly shaped by the rhetoric of naïve scholars who seem to think multi-culturism and fake pluralism is good for a nation when history has always proved that it is not. When will naïve people understand that the infiltration of Islam in Europe has been the worst thing to happen to Europe since WWII. It does not take a PH.D to conclude that an open door policy for any continent is a good idea. Europe does not owe Islam anything and it is not "Nazi-ish" to think on these grounds. Europe has a deep Christian history and should preserve it and re-hash it. It does not owe Islam ANYTHING. Alan, Europe has a strong Christian history and Christian roots. Please, don't be like Hitler or an Islamic extremist and try to erase that! Amanda Richards, Europe has history and strong pagan roots. Actually Christianity conquered Europe in an aggressive imperialist way, often using terrorism burning, destroying and killing - from Greece and Rome to all eastern Europe and the northern Viking gods. And I’m not like Hitler but I’m also NOT using religion to excuse xenophobia, prejudice and racist behaviour like the jihadis do. I love Christianity! It saved me! Jesus is the best. You can say everything you want Alan about how some warrior popes and politicos used this religion to control and conquer Europe but, just face it, Christianity is still The largest religion in the EU and let us hope it stays that way. Jesus lives on!